This year's honorary members taking part in the French classic include "Fredrico Suave" (Fernando Alonso) who will waive the Green flag and thee "Scottish Terrier," three-time 24 Heurs du Mans winner and reigning WEC champion Allan McNish as the Grand Marshal. 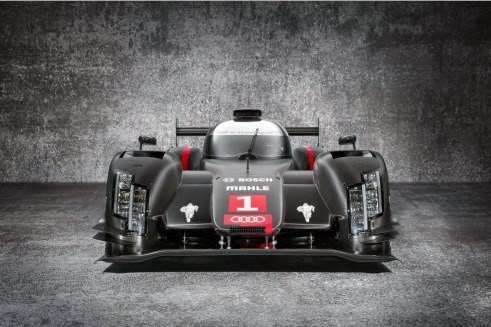 Although there's nine LMP1 entries this year, I don't expect Rebellion Racing to be victorious, as I've listed the three main contenders for victory this year, albeit I don't expect Porsche to win either, since after all its their debutant race since returning to the top class in the new Hybrid era. Thus, while I'm hoping for one of the Toyota's to be triumphant, as surely they'd prefer seeing Nakajima on the podium's top step, I'm still undecided between the two entries, while I suppose Y'all should never bet against Audi. Although Toyota ultimately lost the WEC crown and Le Mans to its German rival Audi last year, nevertheless it finished runner-up at Circuit de la Sarthe and has impressively blitzed the field in this year's opening rounds of the World Endurance Championship with its latest Sports Car challenger the TSO40-Hybrid, as the Japanese team retains all six of its drivers from 2013, many being past Formula 1 pilots, as could this be Toyota's year to join the ranks of Mazda as overall winners? As they've only lost twice to rival competitors since entering prototype competition in 1999, when BMW was victorious and Peugeot defeated them in 2009 - while technically Bentley won in 2003, albeit their parent company Audi supplied them much of its winning technology that year. As the New Kids on the Block, not really sure what to expect for Porsche's first time out in the new Hybrid era, although Porsche is synonymous with winning at Le Mans and has very wisely split the accomplished pair of former winners Romain Dumas and Timo Bernard, who won in 2010 for Audi as the lead drivers of its two car effort respectively. While I won't attempt running down the entire entry list for this year's race, as there's a pretty good summary provided by the fine folks at motorsport.com which also includes a complete entry list. And as typical, I cannot find any definitive press releases regarding this year's television coverage Stateside other than the race will be shown live on the Fox family 'O networks, whatever the HELL that means, as we don't get FS2 here in Seattle, although I'd expect portions to be shown on FS1, nee Fox Sports-1, to which I'm not sure if I'll be watching or not? So as always: Check your local listings! Due to Loic Duval's 'Meaga shunt at the Porsche Curves, which has claimed a number of victims Pre-race this year, Doctors have not given Duval permission to race this weekend and thus, 2009 winner Marc Gené, an ex-Williams and Ferrari F1 test driver amongst things has been called up from his LMP2 team to join the Audi squad as Duval's replacement.